Intesa founding partner Margie Newman was recognized as a finalist at the SDBJ Business Women of the Year Awards. SAN DIEGO — Margie Newman, founder and managing partner of Intesa Communications Group, has been named among San Diego Business Journal’s 2017 “Business Women of the Year” for her notable contributions to the San Diego community. She was recognized as a finalist at a luncheon at the Hilton San Diego Bayfront on November 15. 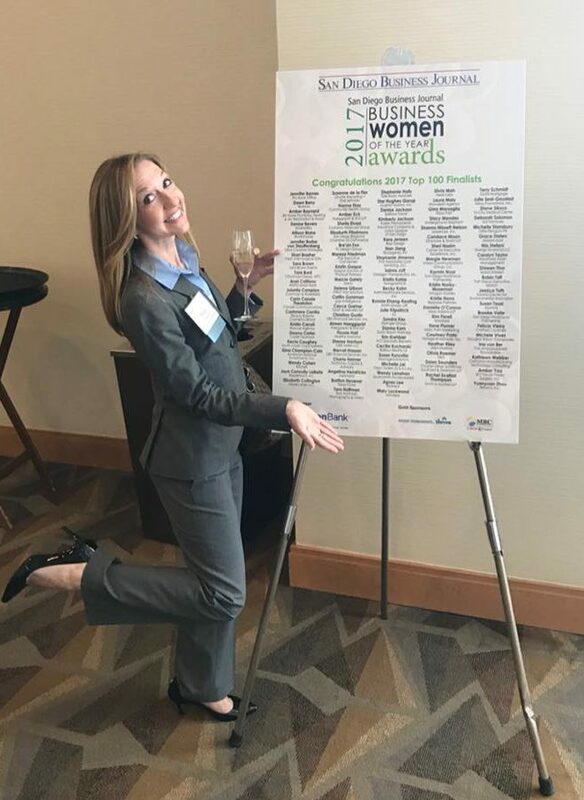 The award is the second this quarter for the Intesa Communications leadership, as Intesa partner Maddy Kilkenny, was named as one of SDMetro’s 40 Under 40 last month. Margie founded Intesa Communications Group in 2012, upon relocating to San Diego from Washington D.C. where she managed media relations and digital strategy for the Pew Center on the States, a division of the Pew Charitable Trusts. She wasted no time giving back to the community she now calls home. From day one, Margie has been engaged civically, serving on various committees of the San Diego Regional Chamber of Commerce, the Downtown San Diego Partnership, and the San Diego Council on Literacy. Currently Margie chairs the Regional Chamber’s Education & Workforce Committee, and is a member of the LEAD San Diego board of directors (IMPACT ‘15 and INFLUENCE ‘17) and YMCA of San Diego County Corporate Board. At Intesa, Margie is the go-to expert in all things communication strategy, crisis communications, and media relations for local, national, and international organizations. She is a proven, trusted partner for a wide range of clients, such as San Diego State University, AFT Holdings, the National Science Foundation, CP Kelco, the Alliance for Early Success, Workshops for Warriors, and H.G. Fenton Company. Originally from Nashville, Tenn., Margie is an Auburn University graduate. She often can be seen teaching her daughter Suzianne and son CJ how to chant “War Eagle” during Auburn football and basketball games.